El Niño anticipation has been building in South Orange County for months. Record-high ocean temperatures brought waves of pelagic red crabs to Southern California beaches in June—about a month earlier than the tiny red crustaceans usually appear—and with them came the early arrival of yellowtail and bluefin tuna, causing local anglers to speculate whether the accelerated fishing season was a predictor of the severity of the upcoming El Niño. Guesses as to what to expect this winter became clearer last week, when the National Oceanic and Atmospheric Administration released an El Niño Southern Oscillation advisory Oct. 8 stating there is an approximately 95 percent chance that El Niño will continue through the Northern Hemisphere in winter 2015-2016, gradually weakening through spring 2016. The advisory, issued by the Climate Prediction Center and the International Research Institute for Climate and Society, predicted that El Niño will peak in late fall or early winter. NASA Jet Propulsion Laboratory climatologist Bill Patzert said in an interview on Monday that this year’s El Niño will be comparable to, if not larger than, the winters of 1983 and 1998. Patzert described the growing El Niño conditions in the Pacific Ocean—a failure in the trade winds in the tropical Pacific, redistribution of heat from the western Pacific to the eastern Pacific and warming that extends from Peru to Ecuador. Southern California could get some of that early rain in October, November or December, which could put a damper on fire danger this season. However, Patzert said heavy rains usually don’t arrive until January, February, March and April. Patzert added that Southern California cities, especially South Orange County, should prepare for storms that aren’t necessarily stronger, but greater in number. Consistent rain, combined with more than four years of severe drought and South Orange County’s hilly landscape, is a recipe for mudslides and flooding. Substantial rain may be months away, but Patzert noted that, technically, El Niño is already here. Mike Rose, director of disaster preparedness and facilities in Dana Point’s Emergency Services department, said Wednesday that in addition to the city’s emergency plan in place for all natural disasters, staff has been looking specifically at El Niño’s potential and what impending rain events could mean. In order to address impending issues—such as the potential for landslides along Coast Highway and the Capistrano Beach area—Rose said the city has been proactive in its efforts, including keeping the area behind the k-rail on Pacific Coast Highway clear of debris in case of slides. The San Juan Creek channel is also being repaired and cleaned to ensure there’s no backup of storm debris and drainage systems. Rose said discussions are ongoing to ensure that emergency resources and contractors are on standby. 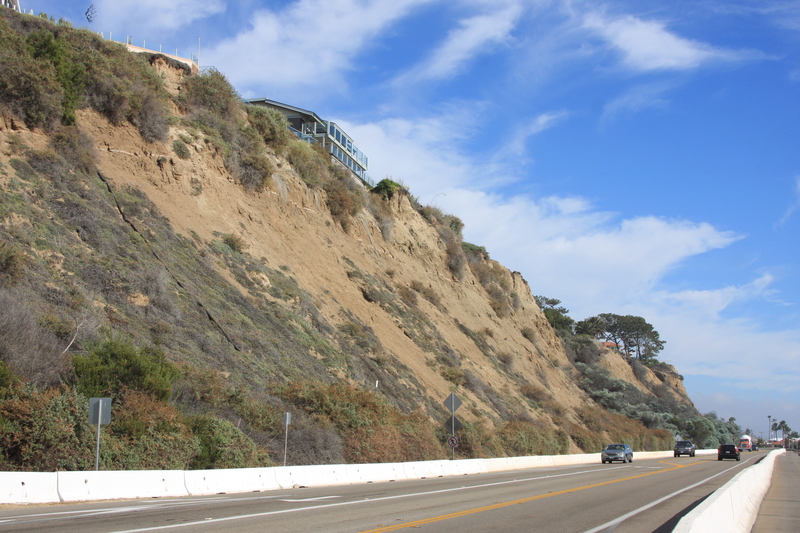 In regard to issues in past years with landslides along Palisades bluff, Rose said, depending on who owns the property, it can legally be either the homeowner’s or the city’s responsibility to clean up debris. “If there’s movement or sliding and debris comes from private to public property, whose responsibility is it? Legally it’s the property owner’s to deal with a slide from their property. 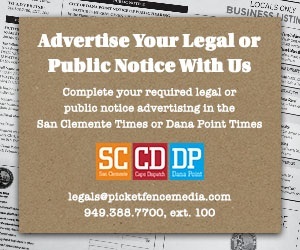 But generally speaking, when it affects public property, we end up dealing with it,” Rose said. Flooding has been a minor issue for Dana Point in the past. Rose said the only intersection that has seen major problems during his tenure has been Camino Del Avion and Niguel Road at the Laguna Niguel border. However, Dana Point Emergency Services Coordinator Aaron Rosen points out that commuters should not attempt to drive through any flooded intersections, no matter how low the water may seem. In addition, Rose and Rosen recommended that residents take precautions such as clearing rain gutters so they don’t cause water intrusion, checking aging roofs, acquiring sandbags and trimming trees so they don’t cause damage during high wind or heavy downpour. Rosen said while both of this year’s Community Emergency Response Team training sessions are done, there may be an additional session scheduled before the end of the year. He encourages residents interested in learning about emergency preparedness to contact the Emergency Services department so they can determine the level of interest in such a session. For information on the city of Dana Point’s Emergency Plan or CERT program, visit www.danapoint.org/emergency or call Emergency Services at 949.248.3579. 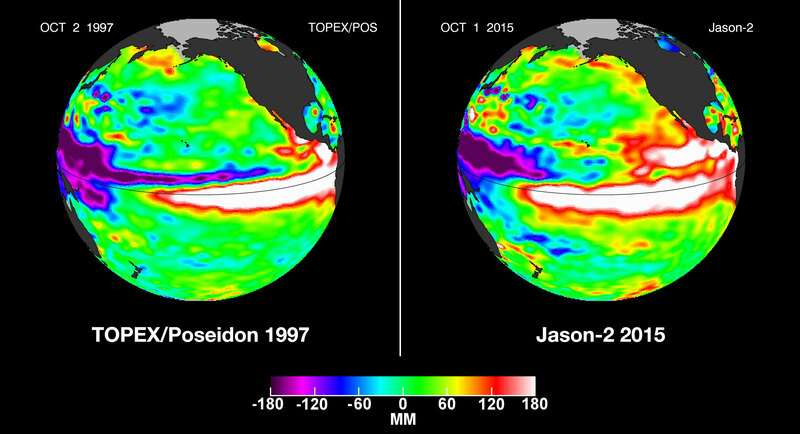 For up-to-date information on this winter’s El Niño, visit www.sealevel.jpl.nasa.gov/science/elninopdo or www.elnino.noaa.gov. While the city of Dana Point had its emergency expo in August, two area cities are hosting readiness events this weekend. In partnership with the city of Mission Viejo and the Irvine Ranch Conservancy, the eighth annual expo will be held Saturday, Oct. 17 from 9 a.m. to noon in the Village Green at the Norman P. Murray Community Center, 24932 Veterans Way in Mission Viejo. The expo is free to attend and will feature an array of disaster preparedness and emergency response vehicles and equipment demonstrations. Agencies and organizations will be on hand to provide information on how to be prepared before, during and after a major emergency or natural disaster. The San Clemente Readiness Festival will take place Oct. 17 from 10 a.m. to 2 p.m. at the Church of Jesus Christ of Latter-day Saints, located at 310 Avenida Vista Montana in San Clemente. The festival is a free event that will teach families how to prepare and be ready for any emergency or disaster. 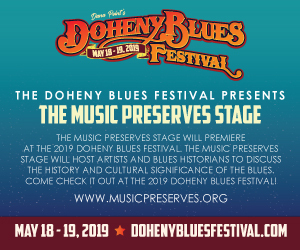 For more information, visit www.readinessfestival.org. For up-to-date information on weather events, natural disasters and other emergency situations in Orange County, follow the Orange County Emergency Operations Center on Twitter at @OrangeCountyEOC or sign up for Orange County EOC email updates on the center’s website at ocsd.org/divisions/fieldops/emb. For information on how to prepare for potential flooding, landslides or other emergencies, follow ReadyOC, Orange County’s emergency preparedness campaign, online at readyoc.org, on Twitter at @ReadyOC and on Facebook at www.facebook.com/readyoc. You can also download the ReadyOC app for iOS or Android. Orange County’s regional public mass notification system, is designed to keep residents informed during emergency events. You can register to receive alerts at alertoc.com.